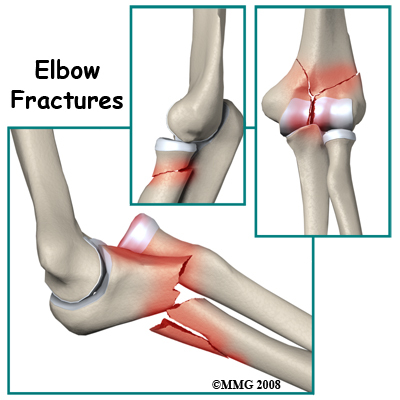 Welcome to Dynamics Physical Therapy's patient guide on elbow fractures. The elbow is a very important region of the arm. It serves as a hinge joint between the upper and lower parts of the arm and allows movements for activities like feeding and lifting. It also allows rotation of the hand and forearm. Together these functions allow us to position the hand in space to perform all its unique and skillful actions. Fractures of the bones that make up the elbow prevent normal movement at the joint and therefore limit the function of the hand, wrist, and forearm. As a result, these injuries must be treated with care to achieve the best possible long-term outcome. The bones that join to form the elbow joint include the humerus (upper arm bone) and the radius and ulna (the two bones of the forearm). There are actually two different joints at the elbow; the first is a hinge joint between the humerus on the one side and the combination of the radius and ulna on the other. 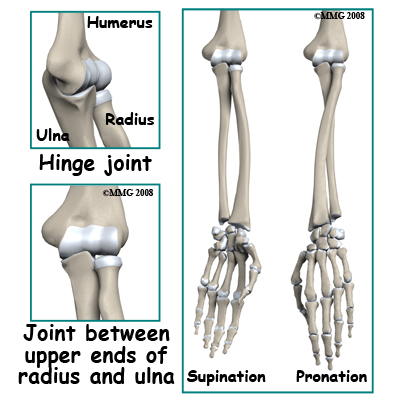 The second joint is between the upper ends of the radius and ulna. The radius can spin in this joint allowing the forearm to rotate. 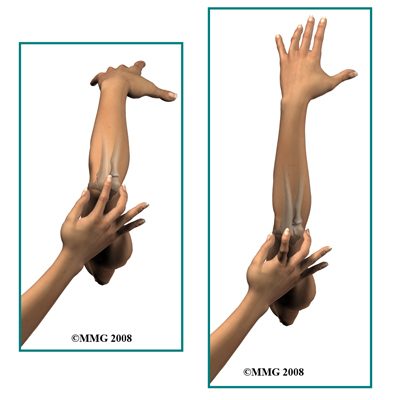 This allows us to position the hand into supination (the hand palm up) or into pronation (palm down). The lower end of the humerus has a complex shape. The tube-shaped shaft divides into two columns just above the joint. These columns support the condyles of the joint. 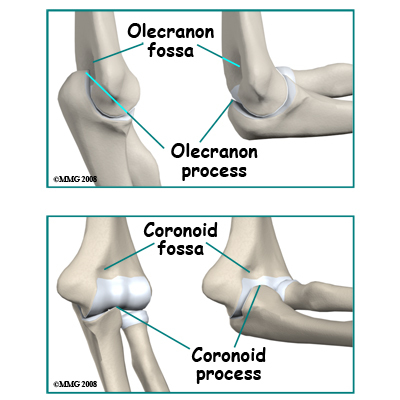 You can feel these two condyles as the two bumps of bone on either side of the elbow joint, the medial epicondyle and the lateral epicondyle. This joint has cavities, grooves and ridges in it to accommodate the ends of the other bones coming from the forearm. The joint surface of the humerus is covered by articular cartilage. Articular cartilage is a smooth slippery material that is hard wearing and well adapted to protecting the bone surfaces that move on each other inside the joint. There are three features of articular cartilage that are important when considering fractures that involve a joint. First, articular cartilage is nourished by joint fluid and does not have a blood supply of its own. Secondly, articular cartilage does not re-grow. Any damage to articular cartilage is permanent. Any gaps or ridges in a joint will be filled in with scar tissue rather than articular cartilage. Thirdly, blood vessels do not penetrate through the joint surface. All the blood supply of the bone that supports articular cartilage comes from inside the bone rather than from the side covered with articular cartilage. If a fracture breaks off a piece of bone that is covered by articular cartilage, the bone loses its blood supply and will die. 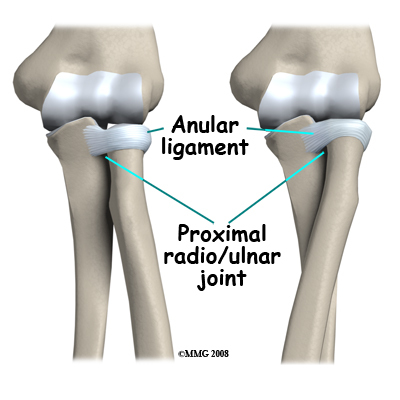 The articular cartilage remains viable because it is still bathed in joint fluid. Some elbow fractures do result in multiple fragments of the joint surface. On a positive note, if the fragments remain in good position the joint surface will survive and the bone may grow underneath the surface to support it. The upper end of the ulna (the bone on the inside of your arm) is shaped like a hook. When the elbow is straight the olecranon process (the tip of the hook) fits into a cavity in the back of the humerus (the olecranon fossa). When the elbow is fully bent the prominence on the front of the ulna (the coronoid process) fits into a cavity in the front of the humerus (the coronoid fossa). The joint surface of the ulna is shaped like the roof of a house and fits into a corresponding groove in the surface of the humerus (the troclear groove). This gives some side-to-side stability to the joint. The upper end of the radius (the bone of your forearm on the same side as your thumb) is called the radial head. It is shaped like a drum to allow rotation of the bone. The part that touches the humerus is slightly concave to fit against a rounded area of the humerus called the capitellum. These bones stay in contact throughout the range of flexion and extension of the elbow. The joint between the radius and ulna is continuous with the joint between the humerus and the ulna/radius, meaning they are all encircled within the same joint capsule. There is a divot on the side of the ulna where the radial head rests and in which it rotates. The entire head of the radius is covered with articular cartilage. There is a ligament, the annular ligament that circles the radial head and keeps it snug against the ulna as it rotates. If the radial head or neck is fractured, due to the anatomy in this region the blood supply to the fractured fragments is at risk. You can easily feel the bony structure of the elbow. With the elbow bent place your thumb on the bone on the inside of the elbow and your long (middle) finger on the outside. The index finger will naturally feel the tip of the elbow. Your thumb is touching the medial epicondyle, your index finger is touching the olecranon process and your long finger is on the lateral epicondyle. With the elbow bent these three bony landmarks form a triangle. As you straighten the elbow the olecranon process (index finger) moves up until all three points are in a straight line. You can also feel the radial head. With the elbow bent it is halfway between the lateral epicondyle and the olecranon. You can feel it rotate as you rotate the forearm back and forth from pronation to supination. The elbow is normally a very stable joint with movement between the upper and lower parts of the arm in virtually one plane only. There is very little side-to-side motion or front-to-back movement. There are strong ligaments that go from the humerus to the ulna and radius that provide the side-to-side stability. Front-to-back stability is more a function of the shape of the bones. In some elbow injuries, especially dislocations, some of the ligaments or their attachments are torn. This can result in instability of the elbow joint if these ligaments fail to heal properly. The muscles that cross the elbow joint also contribute to stability. These muscles either bend (flex) or straighten (extend) the elbow. Two powerful elbow flexor muscles attach at the elbow. 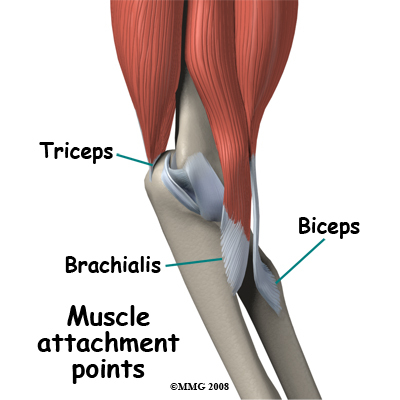 The brachialis muscle attaches to the coronoid process of the ulna and the biceps attaches to tuberosity of the radius. The most powerful muscle of the arm is the triceps, which straightens the elbow. This muscle attaches to the olecranon process, which is the point at the back of the elbow. The pull of any of these muscles is strong enough occasionally to pull off a piece of their bony attachment. This type of injury is called an avulsion fracture.